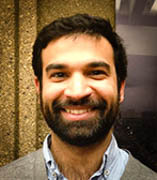 Nasser Mufti’s research and teaching focuses on nineteenth century British and postcolonial literature, as well as critical and political theory. He is especially interested in literary approaches to the study of nationalism. His first book, Civilizing War: Imperial Politics and the Poetics of National Rupture (Northwestern University Press, 2017) (online version and PDF) argues that narratives of civil war energized and animated nineteenth-century British imperialism and decolonization in the twentieth century. The conceptual core of the book adapts a famous phrase of Benedict Anderson to asks what it means to “un-imagine” community, while its historical arc tracks the shifts in narratives of civil war from the Victorian period to the age of decolonization to the contemporary refugee crisis. Where once the narratives of civil war were directed internally at metropolitan society, today they are directed exclusively outwards at the Global South and provide the basis for liberal-humanitarian interventionism. This project has led him down two research tracks. The first considers what C.L.R. James’s theory of the nineteenth century might look like, and how this might alter the norms of historicism and the historical novel. The second, tentatively titled “Colonial Moralia,” interrogates how postcolonial thought conceives of the idea of the “limit” in its historical imagination. His work has appeared in The Journal of Narrative Theory, NOVEL, Nineteenth Century Literature, Victorian Literature and Culture, and b2o: An Online Journal.